Rajinikanth Film Review From Badshaa. Badshaa Movie. Rajini Film Badshaa. Rajinikanth Badshaa movie. www.rajinikanth.com. The story starts with a marriage scene in which a marriage gets stopped because of 'Dowry'. There comes Janakaraj with money and says 'MANIKAM' gave this money. An operation gets stopped because of the money they need to pay to the doctor.There comes Janagaraj with money and says 'MANIKAM' gave this money. Everyone will be wondering who is that Manikamm and there comes our "SUPER STAR" RAJINIKANTH with his All time hit song "Auto Karan Auto Karan Nalum therinja Route Karan". RAJINI runs his life working as an auto driver who is the head of his family. He runs a peaceful life and he takes care of two Non blood sisters and a brother. The initial scene in this movie was well taken with the regular 'RAJINI's acting and comedy. Rajini's True color comes to picture as Rajini hits Anand Raj badly and his brother who is a police inspector asks him "Who are you and what were you doing in Bombay". 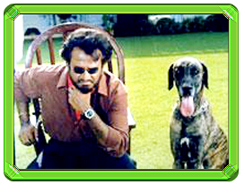 Then the other side of RAJINIKANTH that is "BADSHAA" comes to picture. The story takes a serious track after that as our RAJINI behaves like DON who actually became a DADA because of RAHUVARAN. The way Rajini walks will be really funny. He will be in a Suit with a Dadi and with a Cooling glass which doesn't have a frame and will be walking with Adiyals who are dressed in Coat with a Back ground music "BADSHAA BADSHAA BADSHAA BADSHAA" with a big tall DOBERMAN DOG in the side and Color Light Flashing on him and our Thalivar will be delivering Punch dialogues like"INDA BADSHAA ORU DADAVA SONNA NOORU DADAVAI SONNA MADIRI" with a Sound coming from his fingers.